Puerto Vallarta is overflowing with natural richness, filled with beaches, mountains and lush greenery. This destination is also a fun-lover's paradise, featuring endless adventure activities along with exciting water sports on many of its stunning beaches. The attractions in Puerto Vallarta are truly entertaining and memorable, allowing you to get in touch with the natural beauty of this popular destination. 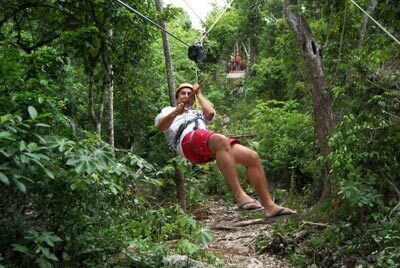 If you're looking for a thrill, there are numerous adventure tours and activities where you can experience horseback riding, enjoy mountain biking tours, slide across a zip line through beautiful scenery or partake in an expedition in the Sierra Madre mountains. There are also boat tours of Puerto Vallarta offering a combination of shows and water sports, like the Pirate Fun Island tour with a vibrant pirate show, as well as Majahuitas Beach, the perfect place for snorkeling and kayaking. Adrenaline junkies won't want to miss out on an ATV tour, where you can drive an all-terrain vehicle through winding mountain roads and jaw-dropping scenery, filled with beautiful birds, plants and wildlife. The rivers are yet another Puerto Vallarta tourist attraction for adventure sports. The Cuale River is ideal for rafting, an activity that combines nature with an unforgettable, heart-pounding experience. <Puerto Vallarta also offers the quintessential setting for a wide variety of water sports like diving tours. Some of the area's best diving spots are in bays throughout the Marieta Islands and in Banderas Bay. Swimming with dolphins in Puerto Vallarta is yet another water activity to put on your itinerary when visiting this beautiful destination. There are a variety of dolphin swim tours available for the entire family. Watch, interact, and play with the dolphins up-close as they perform tricks, without a doubt an exciting and adventurous experience you just have to try. As you can see, this tourist destination has a wide range of possibilities for a fun vacation, featuring adventure, natural beauty, rivers, beaches and mountains, creating the perfect spot for diverse water sports and adventure activities in Puerto Vallarta.